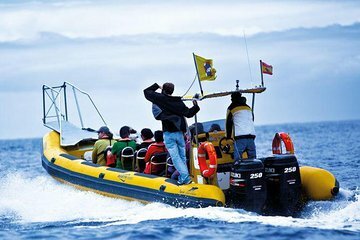 Head out on the waters off La Palma in search of the local whales and dolphins during this boat tour. With a local captain who knows the La Palma waters intimately at the helm, you'll get the best chance of seeing the local cetaceans. Be sure to bring your camera for great photo ops and enjoy listening to insightful guided commentary as you travel. The chances of a sighting are a 94%. The motors of this boat are especially designed for this kind of activity. Passengers will wear a life jack for security reasons. The boat has a maximum capacity for 10 people.